I'm continuing today with the fabric covered journal I started in the last post. In fact, the next few posts called Mini Book Basics, will be the step by step process of creating the complete mini book. 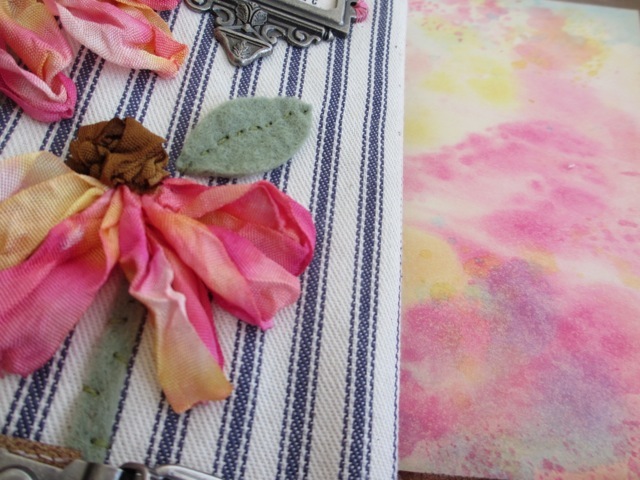 I am hoping you will follow along with me and create your own mini book. You can use whatever paper, colors or embellishments you want...get out that paper, you know, the one in the back that you have been squirreling away for years because they don't make it anymore. Time to dig it out, cut it up, and put it to good use. 1. Title: mine is "follow your heart" that I got from the Remnant Rubs sheet. Do I always have a title when I start? the answer is, no. Sometimes the book does not have a name or title till I'm done with the pages, but for these lessons, I thought I would be easier to identify the divider sections if I started with a title. When building a journal you can have any number of sections or pages. In the example I will be working on we will create four sections and have one of each kind of pages in each section. I do reserve "creative license" on #6 - additional inserts as I never know how many of these I will create when I start a journal. Once I have the idea, I start the gathering process. 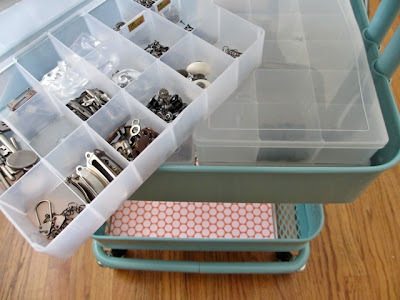 I use my rolling Ikea Cart for basic products that I might use. 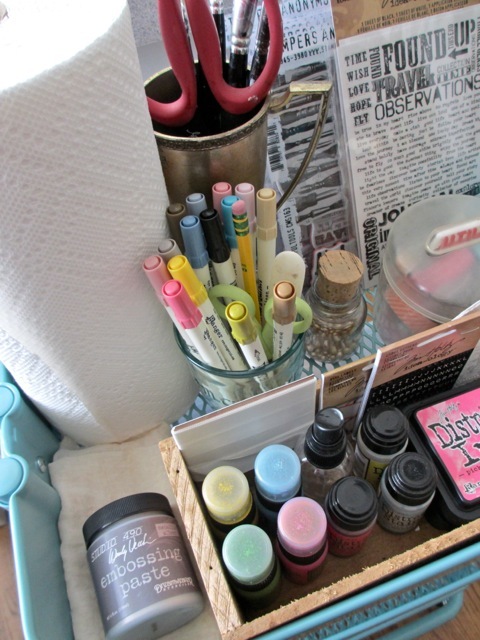 The top tier has paper towels, Tonic scissors, paintbrushes, Distress Markers, Distress Inks and Stains in specific colors. I have also added Wendy Vecchi's new embossing paste in silver...I have a feeling that is going to end up on some of the pages. I can always use other products but this gives me the basics close at hand. The great thing about the cart is it's off the table top so I have more room to work (and I need a lot of room). 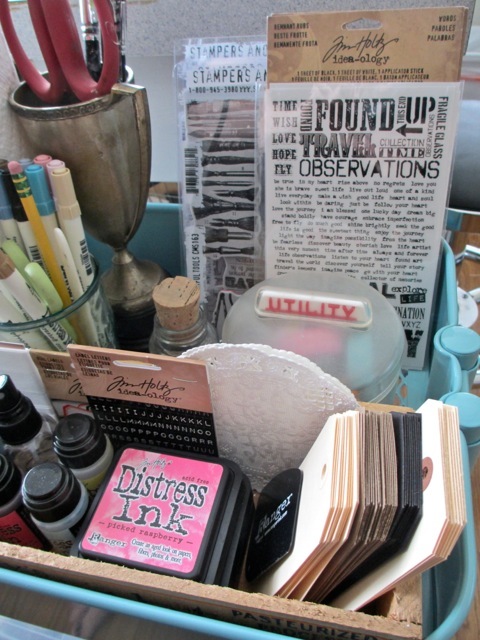 On the right side I have a variety of Ranger tags, Vial Labels, Label Letters, my craft scraper (I will need for the embossing paste), Remnant Rubs (we all know I can't do without those), and a variety of Stampers Anonymous stamps I might use. 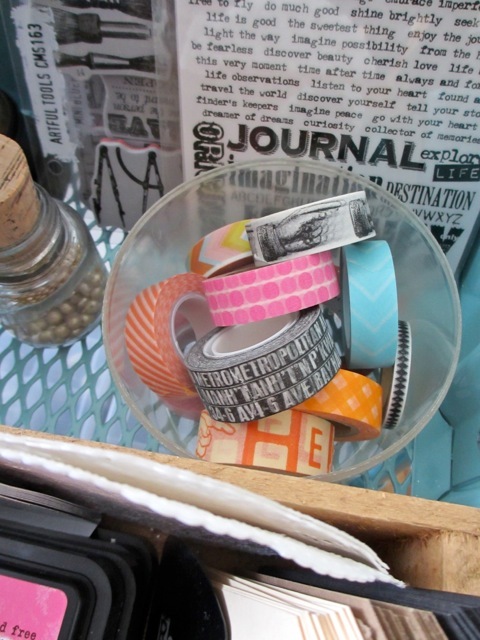 It is filled with a variety of Tissue Tape and Washi Tape...love me some good tape. The second shelf has all my idea-ology trinkets in very utilitarian plastic containers. Four containers fit perfectly in the tray. The bottom tray has a stack of potential papers. Okay, so we have an idea. And now we have gathered the supplies. Lets get started. So today we are going to start with the Divider pages. 1. Setting the tone: The divider pages set the tone for the over all look and feel of the book. 2. Repetition is good: I am going to stick with the colors I used on the cover. I am going to have four sections to my mini book, so I cut four pages from Ranger Manila Cardstock. I like this smooth surface material as a divider because it's a super heavy-weight cardstock that will stand up to inks, stains and the sewing machine. 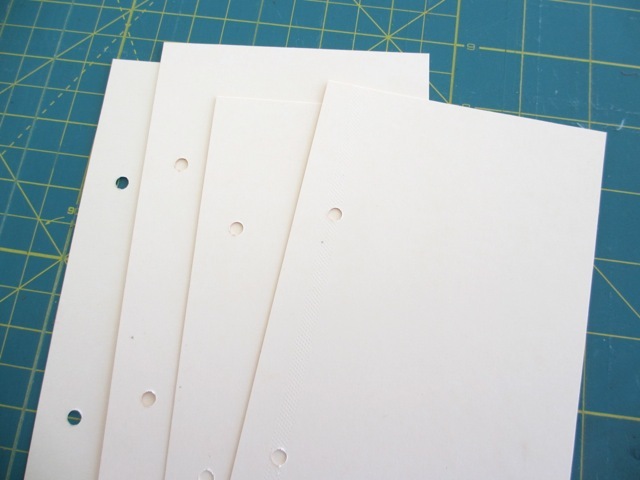 My pages are 4 x 7" (since that fits the Worn Cover I am using) and I have punched holes with my Crop-a-dile before I start. I suppose you could wait till you are ready to put them in the ring binder, but I prefer to punch them beforehand so I know just where the holes will be throughout the design process. 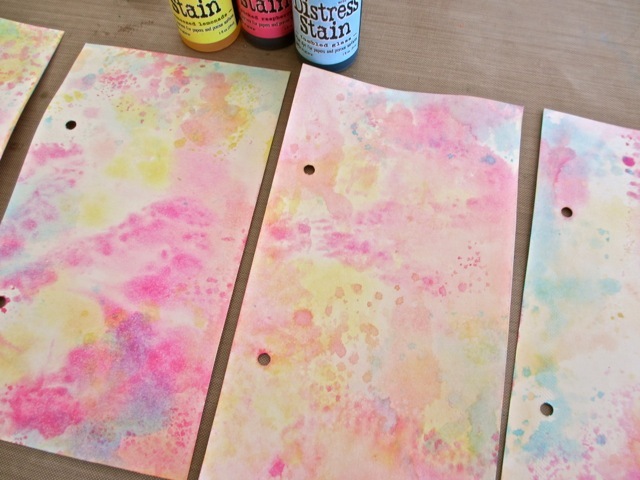 Your pages could be cut from Patterned cardstock but I want to color mine with Distress Stains. I know I have showed this process before so skip ahead if you are a seasoned pro. 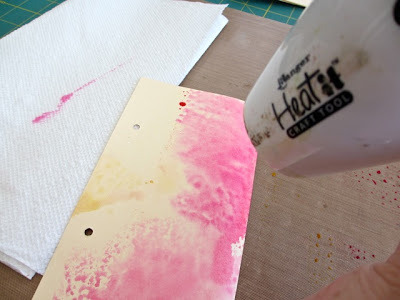 I am using the same two colors, Squeezed Lemonade and Picked Raspberry that I used to color the crinkle ribbon for the cover flowers. That will reinforce the color scheme. 1. 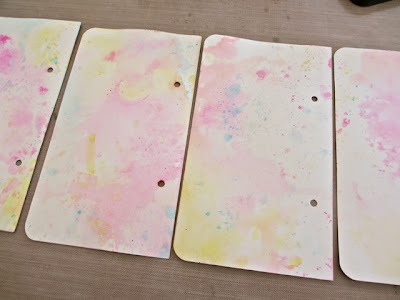 Squeeze out Stain onto non stick craft sheet (I like more pink, less yellow to start). 2. Spritz with water from a mister. 4. Begin to dry with a Heat it tool. 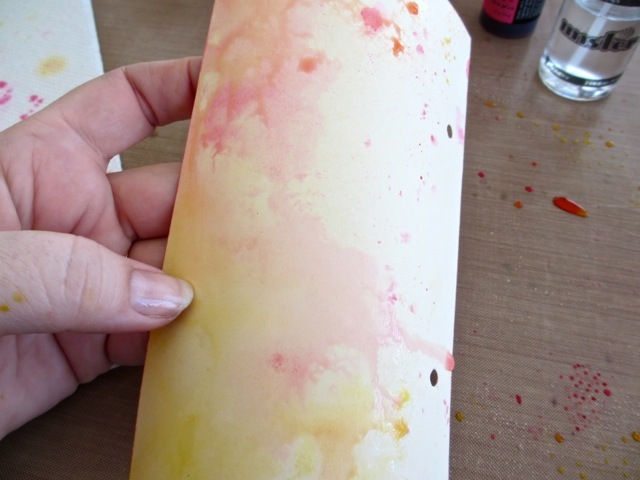 Always keep a paper towel beside you to dab off stain if it is too dark. 5. Repeat dipping into the stain and drying, building the color layer by layer. I finished my first two colors and then added a third, Tumbled Glass after the first two were dry. I find that when I only want a small amount of a color I have more control if I only have that color on the non stick craft sheet. I want the blue color to be an accent to the pink and yellow. 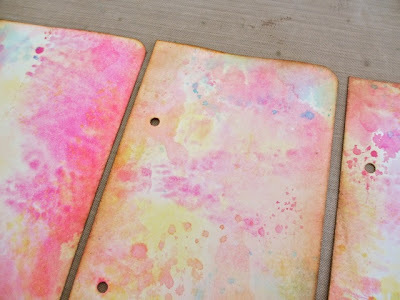 Another thought... if I was to have the Squeezed Lemonade and the Tumbled Glass on the non stick craft sheet a the same time, I could very easily have ended up with green as a byproduct of the two colors mixing. Sometimes this is great, but in this case I wasn't going for green. Best to dry the yellow and pink, then add the blue and dry quickly. If I do a bright front of a card I have a habit of using the same colors on the back. 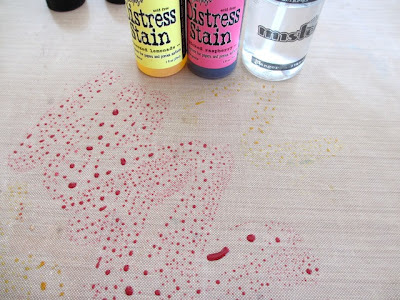 However, I swipe the surface only once or twice, then lightly spritz water directly on the surface to make the Distress Stain bleed. I like the lighter tone the water creates so I can use the back of the card for handwritten messages. Just checking how the divider pages are matching up with my cover. Alright, so the pages are dry, we can move on to completing them. I am rounding corners on the outside right edge. 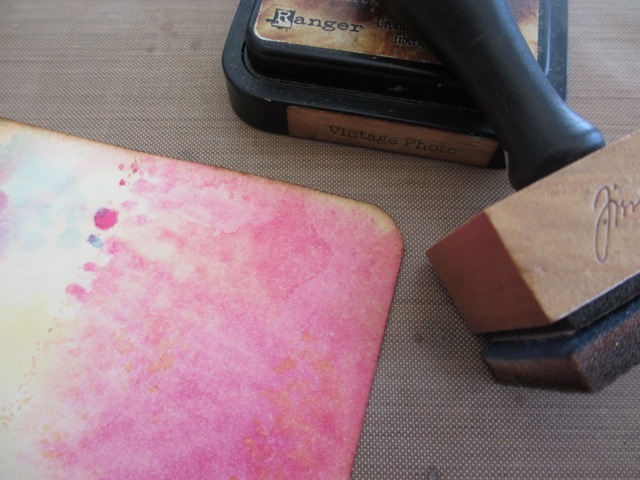 Then adding Vintage Photo Distress ink to the edges, front and back. The ink on the edges warms up the pages quite nicely. I like to use words to define the sections. I chose the words family, friends, work and travel which means I needed three letter "a" so I cut Block Talk Alpha 3 times. I just keep the leftover letters and numbers in small plastic bags for future use. but all four divider pages got a little stitching and kraft core black letters (repetition). Just start. Four little pages of a heavyweight paper. You can do it. I will be back in a few days to check up on you and move on to the next item on the list...what was it? oh yeah, pocket pages. Such a great start! I love the colors. Very inspiring. I think I might have to play along. I wonder if watercolor paper would work well for the dividers? Paula, this is fabulous!!! thank you for the gift of inspiration, it's priceless!!!! Gorgeous! Oh the Spring colors are beautiful and I can feel the warm air and smell sweet flowers! 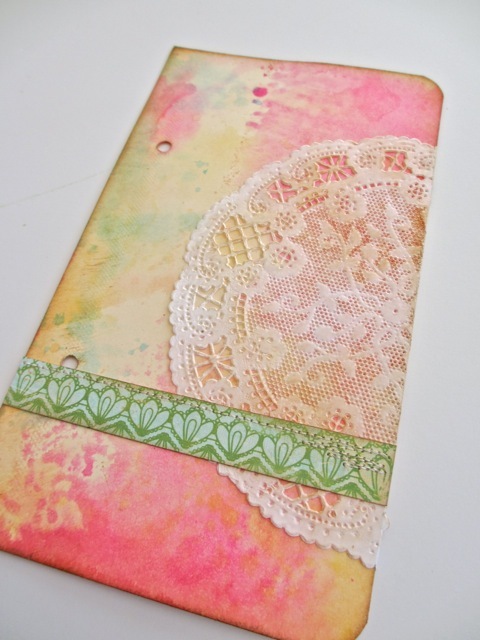 Love all the new Idea-ology embellishments here too! Sooooo beautiful. Thank you so much for sharing! Love it. Gorgeous dividers Paula and I loved your cover on the previous post. Can't wait for the rubbings to arrive over here, the look great. This was very helpful and beautiful! I have never made a mini book before and I'm not even sure I know what one is...but I'm finding this rather fascinating. I'll be checking back again! This is awesome, thanks for sharing it with us!!! Love it! This is beautiful! 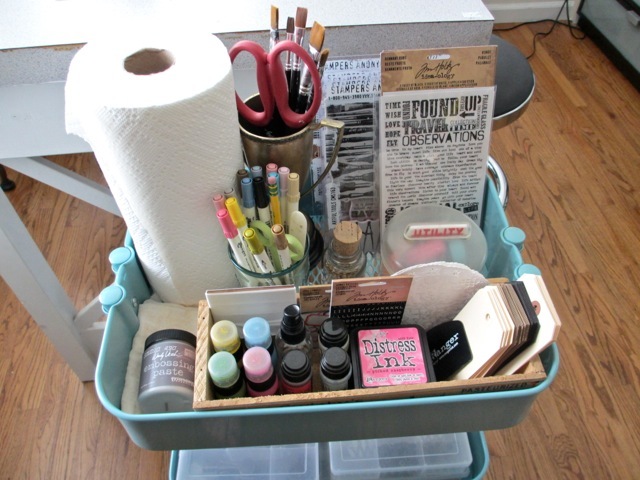 Thanks so much for sharing...I found a few things I NEED to add to my stash! LOL...hugs. 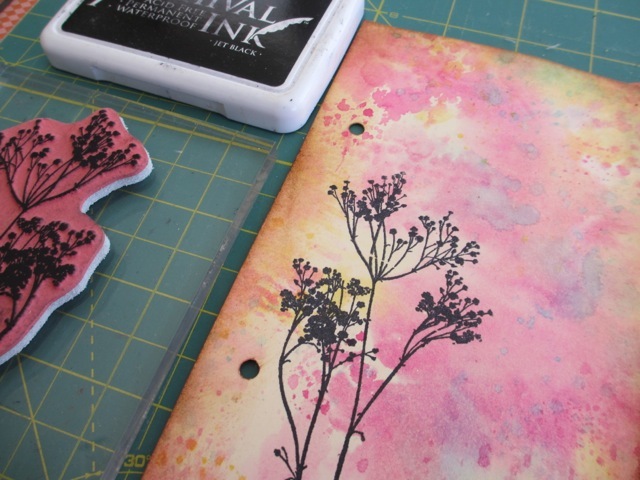 Loving the look so far, can't wait to see what you do with the embossing paste. Why, why, why, haven't I thought of a small cart to use next to my table for items I use all the time. Would free up space and keep it from getting lost under my piles of projects. PS. Love the trophy and the canister you used on your cart. Whenever I run across an old trophy I grab it. Thank you for this beautifull and amazing proyect. It is an inspiration to do it myself!! Thank you again!! You too have a great weekend! Glad I found your tute.......on Tim's FB page, woooooohooooo this looks fun! this is an awesome idea and love your pages!!! 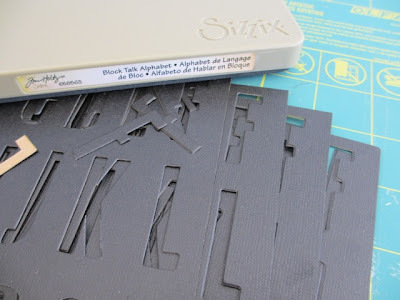 This mini is beautiful and LOVE your instructions! I am loving this project! 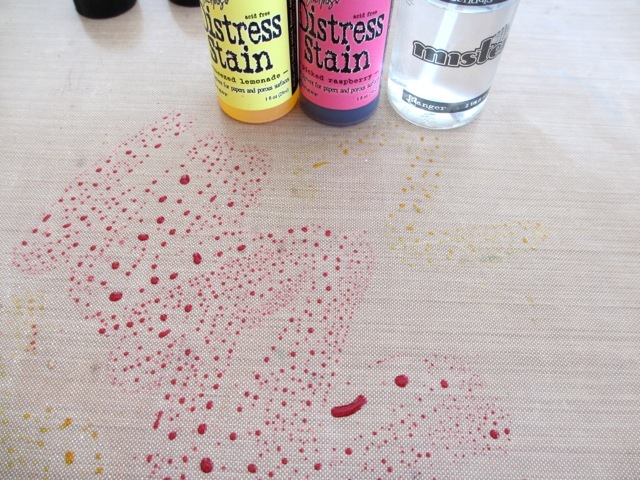 But I think I will try the Distress Paints rather than the stains. We'll see! I love your project ! I love this project like everything else you make! Your instructions are always so clear. I love that you take time to explain even the small details so that no doubts are left in my mind when I read the tutorial. 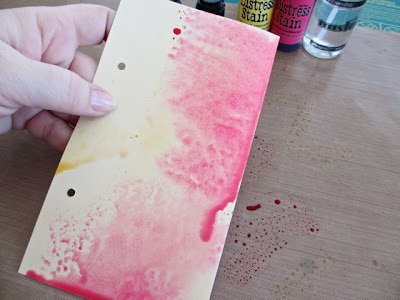 I may even try this project for myself...huh...I even have some distress inks in my stash...never opened...yes it's true. Bought them and didn't have a specific project to use in. Thanks for the inspiration! AWESOME! 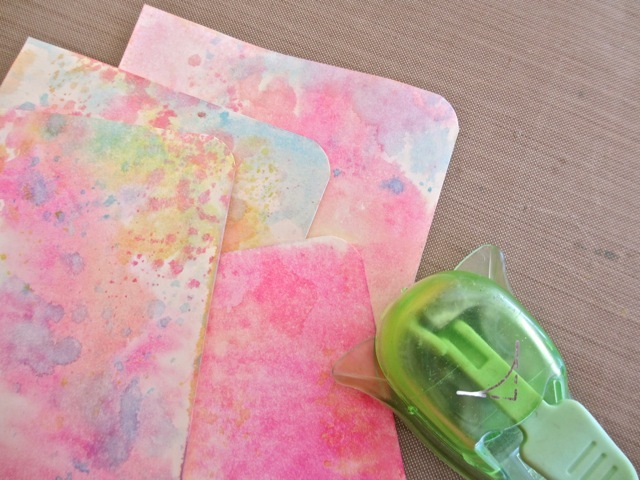 & I can't wait to see how you use the embossing paste. These pages are GORGEOUS! I love the colors. I think I will follow along and make a mini book of my own...can't wait for the next few posts. You are one talented lady! Love these pages! I've always avoided pink and yellow but I'm a convert! Those dividers are gorgeous and I really love how you finished each one. I'm going to follow along, too! Can't you just picture all of us little elves across the world doing the same thing - LOL!! !